Editor’s note: I rarely publish guest posts/contributions, largely because the guest post”concept has been badly abused by individuals or agencies seeking to game the search engine optimization system. However, Chuck Winkles of New Life Painting approached me through the proper channels — namely referencing someone I know — and this worthy contribution could only be written by someone with direct experience with the problem. I’ve been serving California’s Central Coast as a contractor since 1979. Since that time, it’s safe to say things have changed, especially the way we market our business. 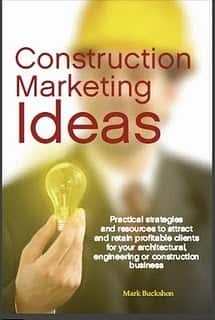 Over the past ten years I’ve seen more traditional, offline marketing be supplemented with new and emerging technologies as we work to grow our company’s online presence. Since opening our doors, we’ve always strived to provide our customers with the best experience they’ve ever had. These days, we’re hoping that in addition to our customers providing their friends with personal recommendations, that they’ll also share their experience online in the form of a review. Why? As many of us know, an increasing number of people are looking to online reviews to get information and read about the experience you’ve provided your customers. 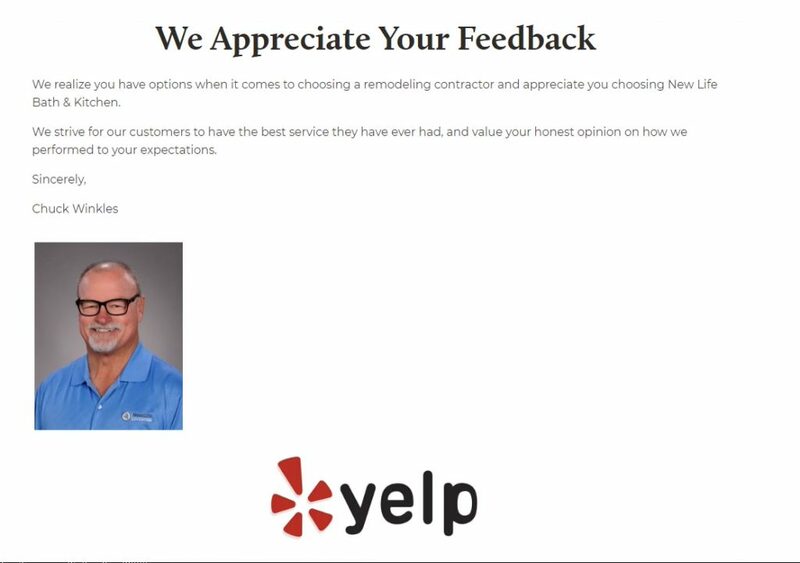 We’ve found from speaking with customers, that our positive online reviews are being read and were part of the reason a prospect decided to call our company. It’s for this reason, that we’ve made earning positive online reviews an important part of our business. But what do you do when you receive a negative review? We recently dealt with a negative review situation and wanted to share what we learned and how we dealt with it. A prospect called our sister company, New Life Restoration to get information on inspections and mold remediation. There was some confusion regarding our process, and the conversation did not go well — finally ending in the customer using abusive language and hanging up on a team member. 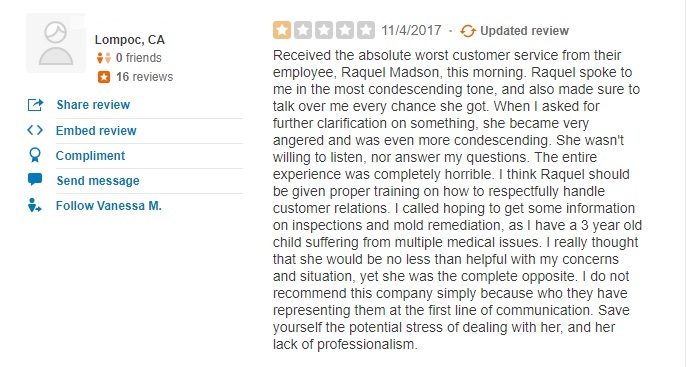 Still very much upset, she decided to share her experience in a review on Yelp. 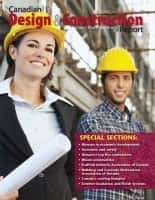 After I had the chance to discuss this call with my team, my knee jerk reaction was to share our side of the story and dispute the reviewer’s claims – in other words, to become argumentative and respond with a tone that may have been construed as unprofessional. Fortunately, I didn’t. While we feel the review was harsher than it should have been, we realized we could have done better. While frustrating, it provided us with an opportunity to discuss the most appropriate way to deal with these types of situations and develop a process that will allow us to better serve our customers. 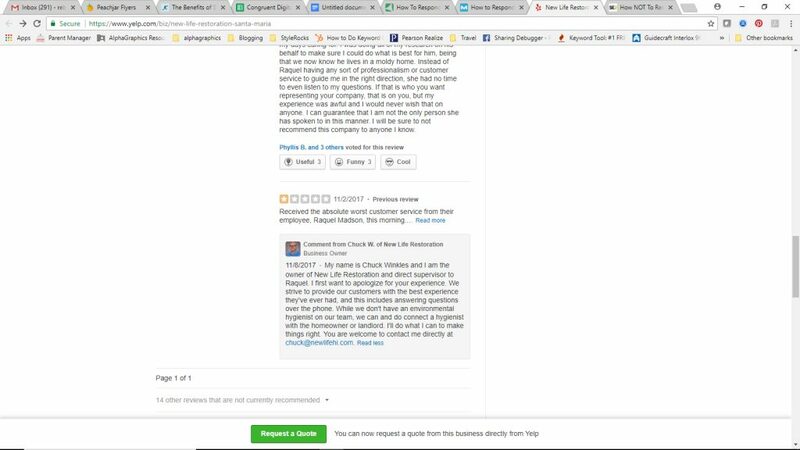 Yelp has terms of service that allow you to dispute reviews they believe violate their guidelines. While this review didn’t meet their criteria for removal, I did want to share so you know this is an option to explore. You can view Yelp’s content and review guidelines here. While this may not always be possible, we’ve found that oftentimes, the most straightforward approach is to contact the reviewer, get their side of the story, and see what you can do to make things right. If you are able to resolve the issue with the customer, you can politely ask them to remove or amend their review. Even if you are unable to correct the situation and get the reviewer to update or remove their review, it’s important to leave a response. Leaving a thoughtful, polite response shows others reading your reviews that you’ve made a sincere effort to rectify the situation. While a negative review may be lengthy and detailed, I’ve learned it’s best to keep responses brief and to the point. A negative review at the top of a page can stick out like a sore thumb. If you are unable to get a negative review removed, your next best bet is to bury it by earning new reviews from your happy customers. As they leave positive reviews, you’ll see the negative review sink lower and lower on the page until it isn’t as noticeable. Do ask the customer in person. This can be after a final walk-through once you’re sure the customer is thrilled with your work. Do remind your customers that they can leave you a review online! Create a step in your customer experience process that includes an invitation for the customer to leave a review. It’s my experience that satisfied customers are typically excited to share their experience. Do let your customers know where you’d like feedback. It’s O.K. to include links to the profiles where you’d like reviews on invoices, in emails, or even on your website. Don’t offer compensation for reviews. Offering something in exchange for a positive review could land you in hot water and is against most social networks terms of service. That’s our story. I’d like to think this will be our last negative review experience ever, but I have a feeling it won’t be. In these situations, I believe it’s not so much the bad review, but how you handle it that potential customers will judge you on. Do you have a negative review story? If so, please share it in the comments below. Chuck Winkles is the president of New Life Bath & Kitchen, New Life Restoration, and New Life Painting. Chuck was born in Southern California and currently resides in Santa Maria. He’s been married to his wife Shelley for forty years and has two sons, Nathan and Noah. Previous articleQuantity vs. quality: The numbers game or excellence?